Summary: Nora Lopez is seventeen during the infamous New York summer of 1977, when the city is besieged by arson, a massive blackout, and a serial killer named Son of Sam who shoots young women on the streets. Nora’s family life isn’t going so well either: her bullying brother, Hector, is growing more threatening by the day, her mother is helpless and falling behind on the rent, and her father calls only on holidays. All Nora wants is to turn eighteen and be on her own. And while there is a cute new guy who started working with her at the deli, is dating even worth the risk when the killer likes picking off couples who stay out too late? Award-winning author Meg Medina transports us to a time when New York seemed balanced on a knife-edge, with tempers and temperatures running high, to share the story of a young woman who discovers that the greatest dangers are often closer than we like to admit — and the hardest to accept. Review: Meg Medina transports readers to one seriously sweltering, tension-filled summer. She created a satsifying sense of place. 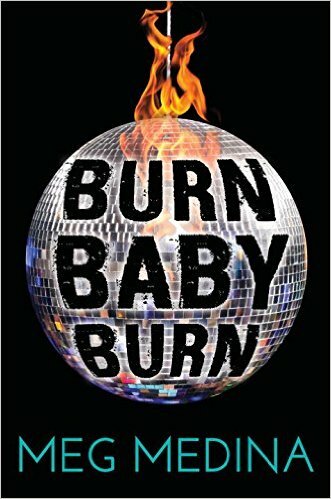 While reading Burn Baby Burn, I saw 70s New York and could practically feel the sweat dripping down my back. This was particularly amazing since my first read through happened during subfreezing winter temps here in the mid-west. Medina seamlessly wove in details that brought the summer of 1977 to life. This was a remarkable summer given the presence of a serial killer in the area. The killings certainly added to the intensity of the novel since that part of the book was based on actual events. The inhumanity was horrifying. It was mirrored on a smaller scale though with Nora’s brother as he becomes colder and increasingly cruel towards his family. Nora and her mother don’t tell people outside the family about his bullying and also avoid talking about it among themselves. The worry about embarrassment or losing respectability keeps them silent even with close friends and relatives. This is a common response in the real world and one that could resonate with many readers. It’s Nora’s senior year and she’s eager to get out and be on her own. The fears and responsibilities are wearing her down. She has no idea how to solve the many problems her family is facing and she is pinning all her hopes on simply escaping. Fortunately, Nora has many people in her life that nudge her toward possibilities. There are two adults in her school encouraging her to go on to college. She has talent for woodworking and fixing things, but has a hard time seeing herself going on to college. The cost, the likely attitudes and prejudice of male classmates, and other hurdles have her doubting. I loved that there are people in her corner reminding her of her strengths and what her future could be if she steps out and believes in herself. Women’s issues come up many times throughout the novel. Nora contemplates her place in the midst of her woodworking classes, how her mother has completely different standards for her and her brother, how men treat her on the street and more. Mary, the Mother of Nora’s best friend Kathleen, is also very invested in the feminist movement. This results in the girls becoming involved even when they aren’t totally sure how they feel about it all. They’re still figuring out what they believe and what is and isn’t important to them. As with other books Medina has written, the main character is Cuban American. She doesn’t always claim this heritage and is conflicted about the times when she passes or doesn’t speak up in the face of racist comments in her presence. Racial issues are not the only theme in the book, but they are certainly present throughout. And then there is the romance. Nora and Pablo have a bit of a rocky road, but it’s a satisfying trip. I really enjoyed the mix in this book. The romance is there, but it doesn’t overwhelm the story. There’s an excellent balance here between friendship, family, community, romance, racial issues and inner conflict. I almost forgot to mention the music! Nora and Kathleen share a love for dance and disco music. I found myself humming along and wanting to track down some of the tunes. Recommendation: Get it as soon as you can! Meg Medina is an excellent storyteller. Burn Baby Burn is intense and suspenseful, but also manages to be hopeful. In spite of the many challenges, or maybe because of them, Nora is able to show her strength. I was cheering her on the whole way. Thanks Lyn. I’m glad you mentioned the Author’s Note. I appreciated knowing about the thought and care that went into her decision making regarding the real people involved that summer. Oh, how exciting! I love Meg Medina and saw her speak at the panel, Latinas in Publishing, at the Texas Book Festival last year. This one looks like a must-buy.